Services for Marine Lance Cpl. Marcus Glimpse, who was killed in Iraq on April 12, were held Saturday, April 22, 2006 at Newport Mesa Christian Church in Costa Mesa. Costa Mesa, CA - Hundreds of people attended the service for Marine Lance Cpl. Marcus Glimpse, 22, of Huntington Beach. 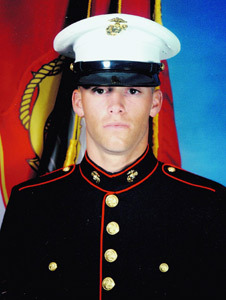 Glimpse was killed on April 12, 2006 in an IED attack in Baghdad, Iraq. 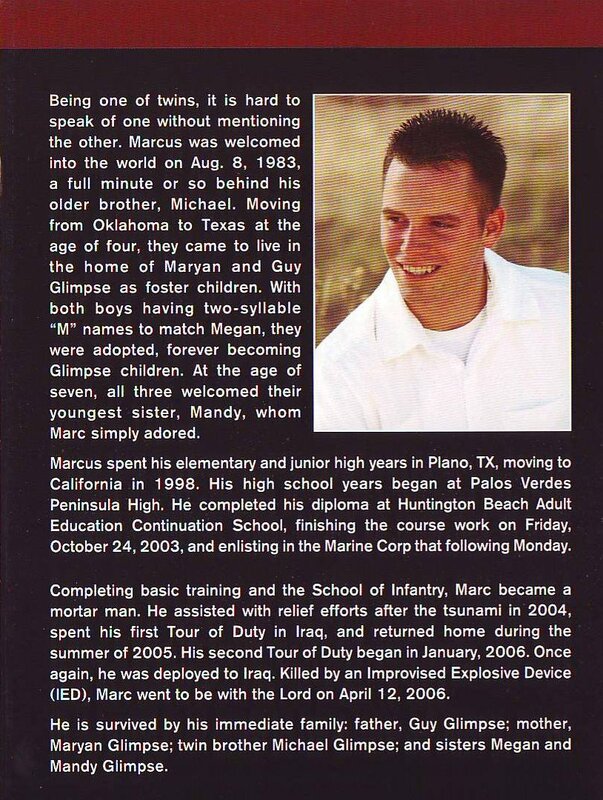 The first photo is a scan of the cover of the brochure for Marcus Glimpse. A photo of Marcus Glimpse is displayed above his flag-draped casket. 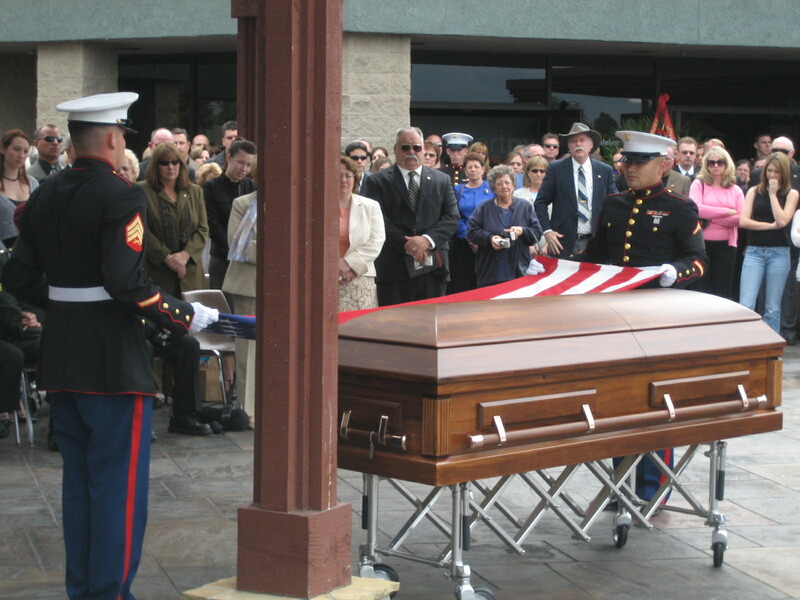 2 Marines remove the flag which covered the casket of Marcus Glimpse. 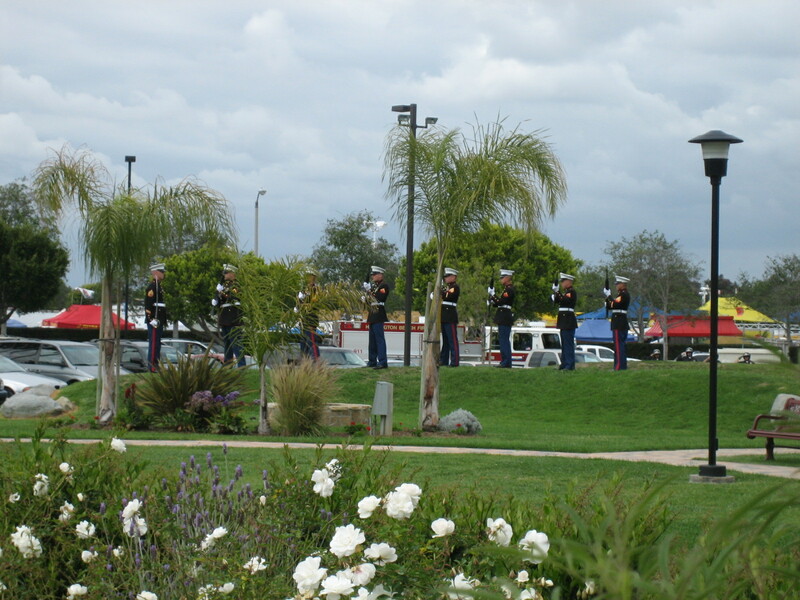 A Marine Honor Guard fires a 21 Gun Salute in honor of Marcus Glimpse. 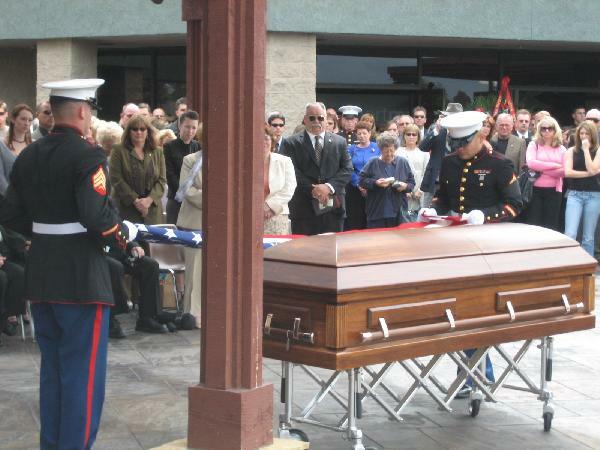 2 Marines fold the US Flag after removing it from the casket of Marcus Glimpse. Marines salute each other as the folded flag is presented. To the left are members of the Glimpse family. 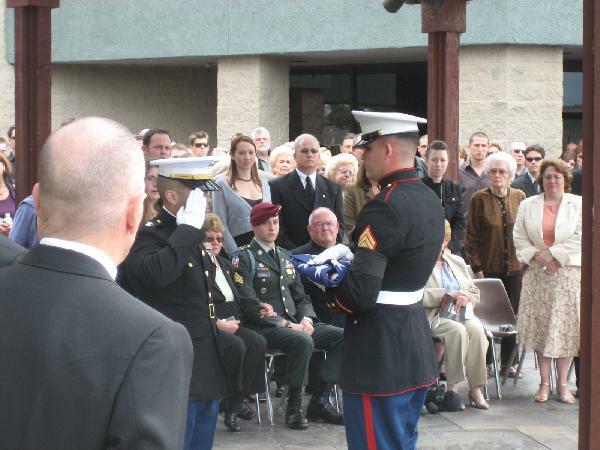 A marine officer salutes as he is presented the folded US Flag. Behind are members of the Glimpse family. A marine salutes his officer after presenting him with the folded US Flag. Behind are members of the Glimpse family. A marine officer presents the folded US flag to the family of Marcus Glimpse. A marine officer presents the Purple Heart award to the family of Marcus Glimpse. The very best of us are wasted. Again they feed off the flesh of our young. Thrown into a killing field. We are told who the enemy is by the ones who turn the crank of the meat grinder. 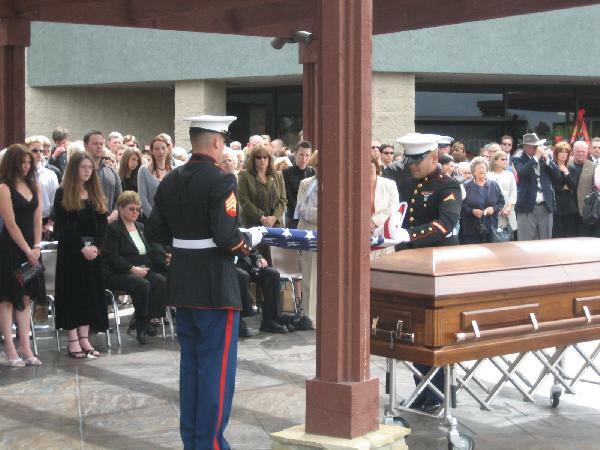 A service with laughter and tears, patriotism and religion recalls a Huntington Beach Marine killed in Iraq. 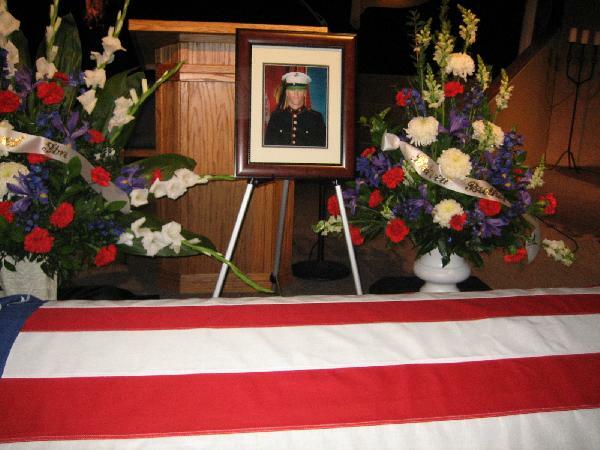 In the slide show as the funeral began, the joyful moments of a young boy's life unfolded. Grinning with missing teeth in a grade-school photo. Proud and happy as he looked at his Teenage Mutant Ninja Turtle birthday cake. All dressed up like Dracula to trick-or-treat with his twin brother and sister. 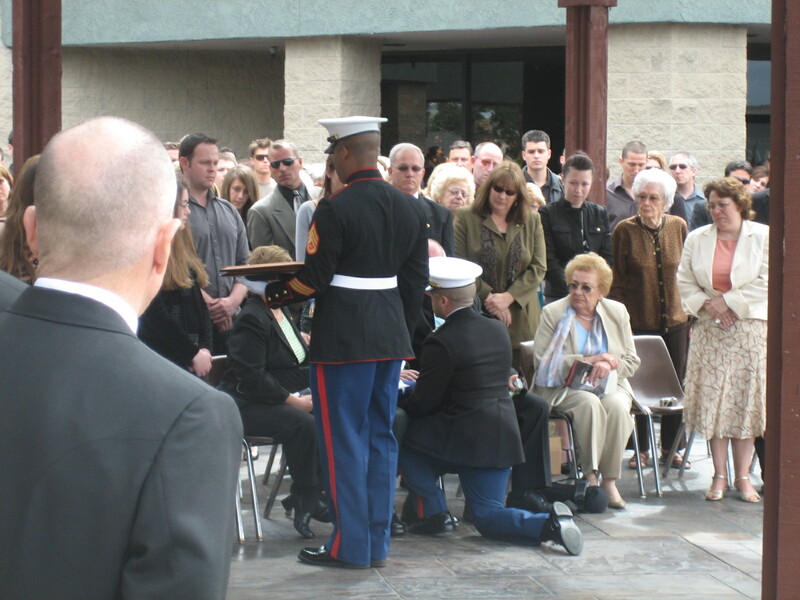 But the portrait on an easel by a flag-draped casket - the one with the boy now a steely-eyed young Marine - made sure none of the 500 mourners forgot the sorrowful reason they were gathered. The family, friends and community that loved and cared for Lance Cpl. Marcus Glimpse honored and celebrated his life Saturday, 10 days after the 22-year-old Huntington Beach man was killed by a roadside bomb in Iraq. He had been conducting combat operations in the Al Anbar province while serving with Camp Pendleton's 1st Marine Division. "When I think of Marc, I think of loyalty," said Mike Glimpse, his twin, dressed in his Army paratrooper uniform. "Marc was always the most loyal friend, brother, son. "He was always there for you," Glimpse said. 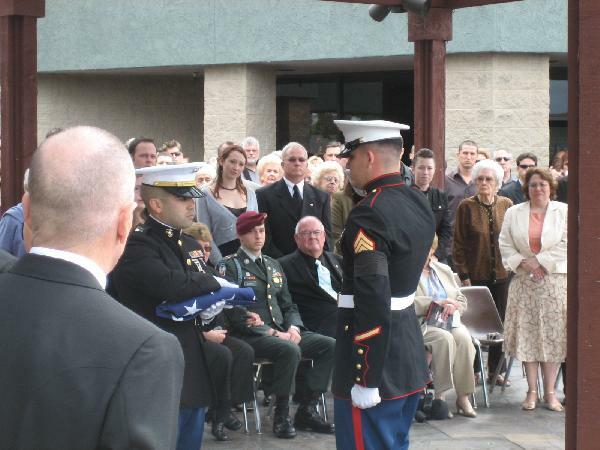 On Saturday, they were all there for Lance Cpl. Glimpse - or Marc, as everyone knew him. In a service that mixed laughter amid the tears, patriotism with religion, the life of a Marine was revealed as the life of any boy or girl who had grown up with a loving family, with plenty of friends and girlfriends, and decided after high school to enlist and serve his country. It was the ordinary moments, the things that people had been remembering since his death, that his family members - brother Mike, sisters Megan and Mandy, and dad Guy Glimpse - talked about during the service, as his mom, Maryan Glimpse, watched from the front row. "Even the things that (ticked) me off at the time bring a smile - like when he would take off his socks after a week at Camp Pendleton and throw them in my face," said Megan Glimpse, 22. "He was my protector, my big brother," said Mandy Glimpse, 15. "He stood up for me in a way that no one else ever could." Guy Glimpse told a few stories about his son that brought laughter to the service - how Marc wasn't tidy but was smart enough to race to his room and push all the mess to his brother's side when ordered to clean his room; or how a kid with a fuchsia mohawk in high school could spend hours trying to decide which black T-shirt to wear on his dates. As Guy Glimpse read a 19th century English minister's essay on death, though, the emotions of the day caught up with him. "'I am but waiting for you, for an interval, somewhere very near just around the corner,'" Guy Glimpse said, his voice breaking. "'All is well. Nothing is past. Nothing is lost.'" After Rep. Dana Rohrabacher, R-Huntington Beach, praised Marc Glimpse as an American hero, and Pastor John Boyer talked how his loved ones will be reunited with him in heaven one day, the service moved outside the sanctuary of the Newport Mesa Christian Center. 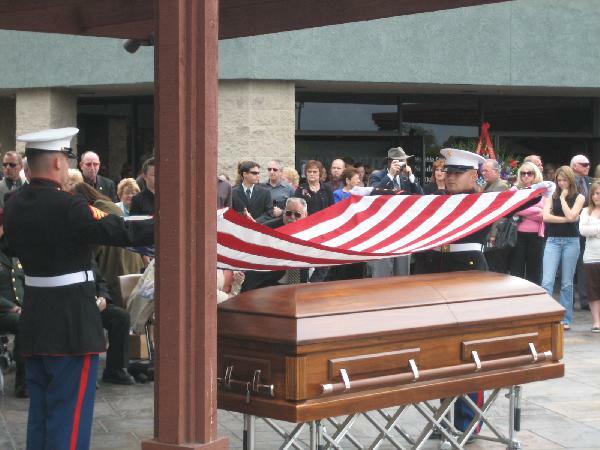 There, as a Marine rifle detail provided the traditional 21-gun salute and taps was played, a Marine funeral detail folded the American flag from Glimpse's casket and presented it along with a Purple Heart to his family, most of whom sobbed as the finality of the moment sunk in. It was the most formal part of the service, and something his little sister suggested Marc Glimpse would probably have been too modest to enjoy. "I know he's looking down on us right now, saying, 'Why are you doing all this, because I don't deserve it,'" Mandy Glimpse said earlier during the service. 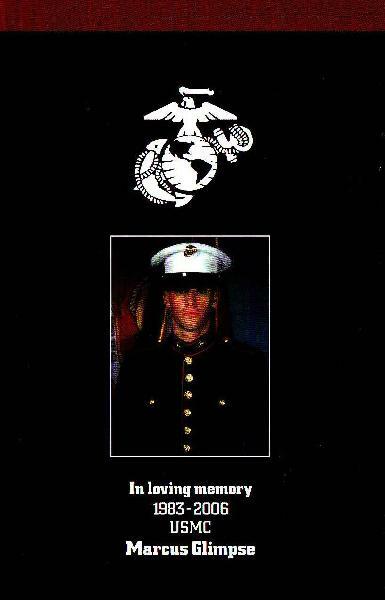 There may not have been a more unlikely Marine than Marcus Glimpse. As a teenager, he dropped out of high school, painted his fingernails black and sported a fuchsia-colored Mohawk. Glimpse couldn't hold a job, even at Blockbuster, where he was fired for being perpetually late — at a store 500 yards from his home. 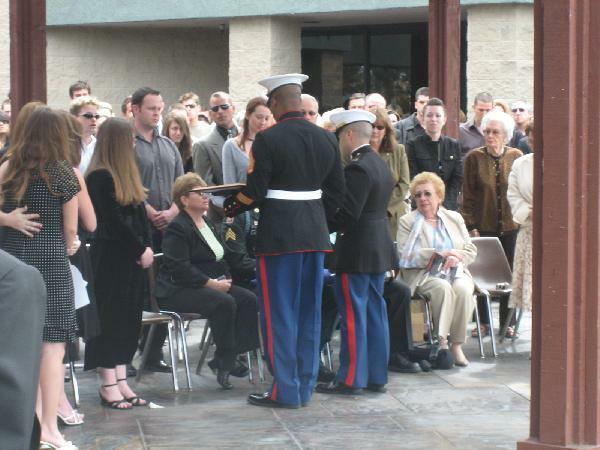 But when his twin brother, Michael, became an Army paratrooper, Marcus wanted to do his brother one better by joining the Marine Corps, said his father, Guy. Glimpse, a 22-year-old Huntington Beach resident, entered boot camp at Camp Pendleton as a 5-foot-9, 129-pound computer nerd who liked to sleep during the day and play video games at night. By the time he graduated, his father said, he was "160 pounds of just pure muscle" and had turned into a quiet leader. "We were so proud of him," his father said. "Being a Marine proved to him that he was more than just this geek kid sitting behind the computer screen. He really could do more than he ever envisioned." On April 12, the lance corporal was killed by a remotecontrolled homemade bomb at a roadside security checkpoint in Iraq's Al Anbar province, west of Baghdad. He was assigned to the 1st Battalion, 1st Marine Regiment, 1st Marine Division, 1st Marine Expeditionary Force at Camp Pendleton. On his second tour of duty, Glimpse had been in Iraq since January. In a letter written just two hours after Glimpse's death, Cpl. Stephen Disharoon detailed for Glimpse's parents why their son was so respected by his fellow Marines. "Glimpse was an excellent Marine, one I had complete confidence in and would trust with my life," he wrote. "I never once heard him complain about anything because it was too hard or too difficult to do…. 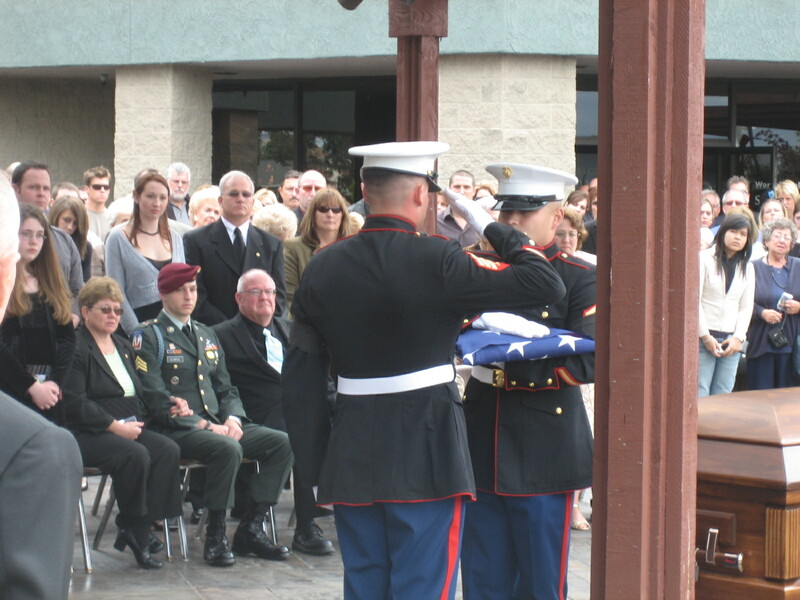 It was a privilege and an honor to have your son be a part of us…. 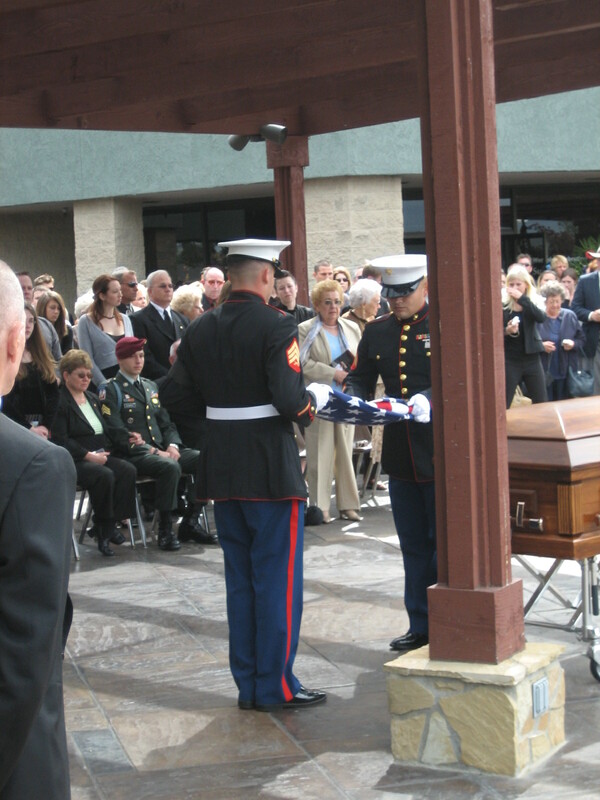 We will remember him forever, a Marine everyone, including myself, should strive to be." 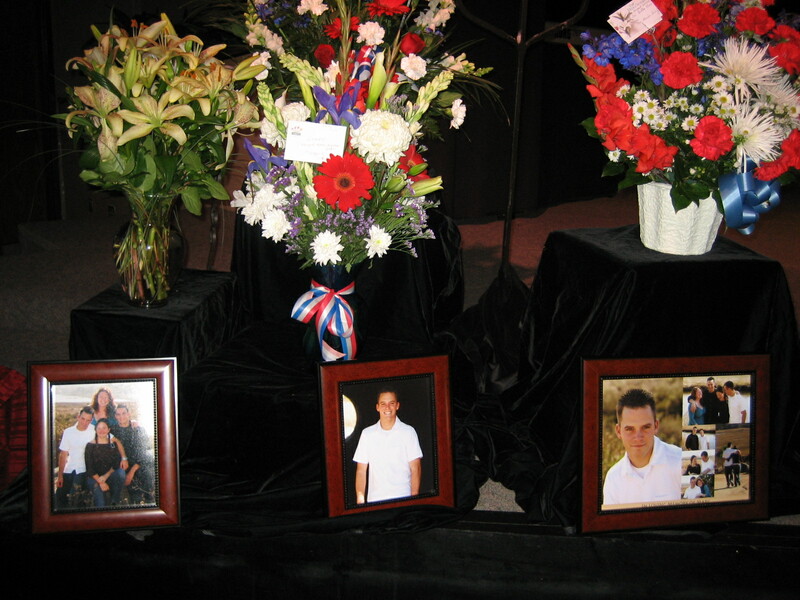 Glimpse was born at Ft. Sill, Okla., and lived in Plano, Texas, before moving with his family to Southern California, where he attended high school. Though a natural athlete, he didn't enjoy team sports and spent much of his time watching "The Sopranos" and playing video games with three close friends. Glimpse's favorite holiday was the Fourth of July. As the sun set, he would lead a group of neighborhood children across the Santa Ana River from Huntington Beach to Costa Mesa, where fireworks were legal, and put on a pyrotechnic show. His father, who described him as "my best friend," said Marcus "lost his way a bit" when his twin brother enlisted in the Army after the Sept. 11 terrorist attacks. "His absence left a void in Marc," Guy Glimpse said of Michael, noting that the twins had never lived apart. When Marcus decided to join the Marines in 2002, he needed to go back to high school to get in. Six months later, he earned his diploma and joined the Marine Corps, scoring near the top of each intelligence test, his father said. Guy Glimpse said his son wanted to go into military intelligence but was assigned to be part of a mortar team. Later, he became a machine gunner. Michael Glimpse spoke of his brother's character. 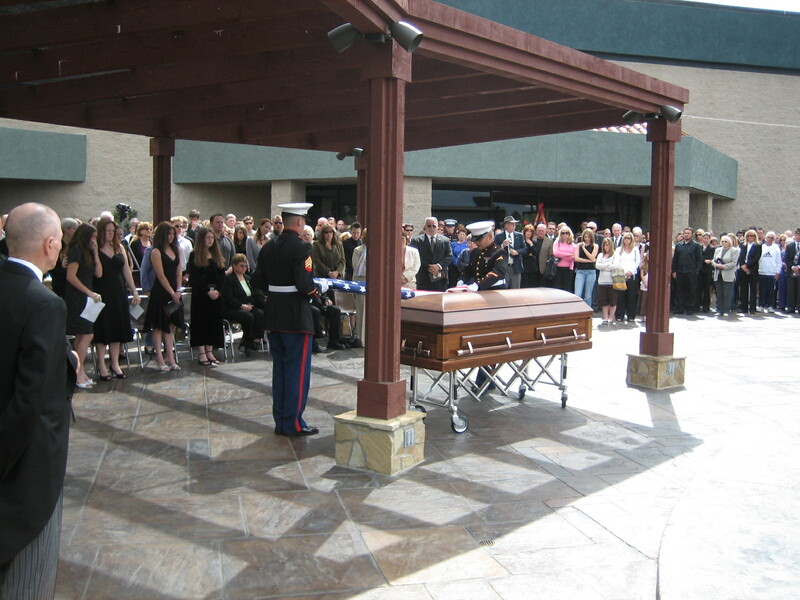 "The most admirable thing about him was his loyalty to his family and friends," he said. "Being a Marine helped show [his good qualities] a lot more. It helped chisel away the rough edges." With his enlistment up in 2007, Marcus was deciding whether to reenlist or go to college with the goal of becoming an attorney. "I've always known how talented Marc was," his father said. "Finally he did too." In addition to his father and brother, Glimpse is survived by his mother, Maryan; and two sisters, Mandy and Megan.